1. In a large pot boil 3 cups of water on medium heat and then, add the Chicken and Olive Oil. Cover the pot. 2. Please, always turn off the flame when adding something to the pot and use a pot holder;always do safety! Add Seasoning to the Chicken pot. 3. Cut on your cutting board in small strips the Red Pepper that was already rinsed well outside and inside and the seeds removed and the stems cut off. 4. Cut on your cutting board your Red Onion in small pieces that you rinsed well with cold water. 5. Take the big part of the Broccoli off on your cutting board and rinse well with cold water and add to the Chicken Pot. 6. Take the Asparagus and rinse with cold water and then add to the Chicken pot. 7. Tomatoes that were already washed with cold water cut in quarters on the cutting board and add to the Chicken pot. 8. Rinse the Squash with cold water and cut off the ends on your cutting board and peel and slice it and add to the Chicken pot..
9.Cooking Time 30 minutes: please, set your timer. 10. Cook Brown Rice according to package. Cover while cooking. 11. Serve your Chicken and Vegetables on a bed of Rice on a platter. 12. Optional pour on a good amount of Teriyaki Sauce. 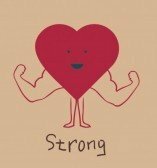 All enjoy my Heart Strong Chicken Stew! 1. It is low in calories-only 36 calories, less than 1 gram of fat, 7 grams of Carbohydrates and a gram of protein. 2. Also it is cholesterol free. 3. It is a high source of vitamin C and a very good source of Vitamin A, fiber, folate, magnesium, copper, riboflavin and phosphorous. It has a great amount of potassium. Also it is high in Maganese. 4. It has reduced the risk of Heart attack and stroke because of the magnesium. Also our cutting down on fat and cholesterol foods is a huge way of reducing our risk of Heart disease. The vitamin folate removes an unhealthy by product called homocysteine, which is believed to be associated with Heart attack and stroke. Yellow Squash is very rich in fibre and it thoroughly lowers high cholesterol levels and reduce our chance of Heart disease and atheroscles. 5. It is high in Vitamin C which is key in preventing Cancer and preventing premature aging. 6. It promotes regularity and adds bulk to our stool (due to it’s high fiber). 7. It gets rid of a condition named benig (BPH). A man with BPH suffers with an enlarged prostate-it effects sexual functioning. 8. It prevents cataracts and macular degeneration. 9. Squash maintains our healthy bone structure, enzyme creation, and bone building. Also it aids to the mineral density of our spinal column. It helps us from getting Osteoporosis. Julia Zumpano, RD, LD, a dietician with the Preventive Cardiology Center of the Cleveland Clinic said, “There really is an abundance of fruits and vegetables in many colors, shapes, sizes that are good for your heart;” “You can definitely reduce your risk of developing cardiovascular disease by eating these foods every day”. Please, always consult your own doctor before changing your diet. My sources for my Blog were my own observations and recipe, Wed MD and Health Diaries.